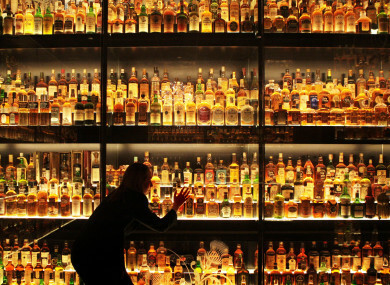 The Scotch Whisky Experience in Edinburgh. BRITAIN’S HIGHEST COURT has supported the Scottish government’s plan to impose minimum prices on alcohol, ending a five-year long legal challenge from a leading drinks industry group. After this ruling, Scotland is expected to become the first country in the world to introduce the minimum pricing ruling, which could come into effect as early as next year. Scottish lawmakers want a price of at least 50 pence per 10 ml of pure alcohol in a beverage, to stop people “drinking themselves to death” in a country with rising fatalities from alcohol abuse. The Scotch Whisky Association (SWA) – backed by spiritsEUROPE and wine industry representatives Comité Européen des Entreprises Vins (CEEV) – asked the Supreme Court in London to strike down the policy after the European Court of Justice (ECJ) said it would breach EU trading rules if alternative tax measures could be introduced. But seven Supreme Court justices in London dismissed the SWA’s contention, ruling unanimously that such pricing is “a proportionate means of achieving a legitimate aim” and does not breach EU law. Scotland’s semi-autonomous government cannot vary tax on alcohol, as this power is held by the British government in London, but it can regulate the retail sector north of the border. Scottish First Minister Nicola Sturgeon, who devised the plan in 2009 when she was health minister, said she was “absolutely delighted”. This has been a long road, and no doubt the policy will continue to have its critics, but it is a bold and necessary move to improve public health. There were 1,265 alcohol-related deaths in 2016 in Scotland, a 10% increase on the previous year in a nation of 5.3 million people. A 50 pence minimum price would mean a 70cl bottle of whisky will cost at least £14 (€15.6 euros), a 70cl bottle of 37.5% vodka at least £13.13, four 440ml cans of 9% lager at least £7.92 and a 75cl bottle of 12.5% wine could be sold for no less than £4.69. It would not directly impact on Scotland’s premium whisky, which is already sold at well above the minimum price, but the SWA fear it could lead to international trade barriers. Ignacio Sanchez Recarte, secretary general of CEEV, said they were “disappointed” by the ruling and said other EU member states should not consider adopting Scotland’s “experimental” policy until its impact becomes clear. The Institute of Public Health in Ireland welcomed the UK Supreme Court decision, saying that it could affect policy decisions for the Republic. Today’s UK Supreme Court decision will help inform decision-making on this issue in Northern Ireland as will the recent decision by the Welsh Government to publish a Minimum Unit Pricing Bill. The UK Supreme Court decision is also important for the Republic as Minister Harris has said that the timing of the introduction of Minimum Unit Pricing in the South will have regard to developments in the North. At this crucial point, it is a welcome boost to Minister Harris and the government as they slowly progress the Public Health (Alcohol) Bill. Email “Scotland to be the first country to introduce minimum alcohol pricing”. Feedback on “Scotland to be the first country to introduce minimum alcohol pricing”.